Copyright: © 2016 Elgendy HM, et al. This is an open-access article distributed under the terms of the Creative Commons Attribution License, which permits unrestricted use, distribution, and reproduction in any medium, provided the original author and source are credited. Objective: To explore the association between anesthetic requirements of children subjected to ABR test and the degree of abnormality discovered by the test. Methods: Operative anesthetic data including propofol and midazolam dosages were collected retrospectively for children undergoing ABR tests. Propofol doses were log transformed and entered as dependent variable in linear regression models with weight, height, body mass index, intelligence quotient, CARS score and the extent of lesion by ABR (none, unilateral or bilateral) as covariates and gender as a factor. Independent variables with significant associations were used in multiple regression models. Results: In 227 total study cases, no lesion was identified in 62 cases, a unilateral lesion was identified in 80 cases, and bilateral lesions were identified in 85 cases. Autism was diagnosed in 31% of children. Simple regression showed significant association of weight, extent of lesion and midazolam dose with the log propofol dose. In multiple regression, the three variables retained their significant association with coefficients and 95% CI of (-0.013) and (-0.024)-(-0.003), 0.111 and 0.034-0.183, and (-0.197) and (-0.271)-(-0.124) respectively. Recovery time was similar among the lesion groups indicating a real need for larger doses. Conclusion: Children with autistic lesions may require larger doses of propofol for sedation. ABR testing may provide key clinical information about the anesthetic requirements in autistic patients. More studies are required to assess the safety of anesthesia in children requiring larger doses of medication for sedation. Auditory brainstem response (ABR) refers to electrical activity of the auditory system that occurs in response to appropriate acoustic stimuli. It is an accurate, reliable, and a non -invasive test, which is conducted to estimate auditory sensitivity and integrity of auditory brain stem pathway. ABR consists of a series of seven waves, occurring within 10 min after stimulus. This is a diagnostic test performed outside the operating room and requires sedation to keep a child still during the procedure . Despite early signs, children with autism spectrum disorders often do not seek medical advice until after the second year of age when language delays are observed. Fifty to seventy percent of autistic children have historically been classified as intellectually disabled by nonverbal intelligent quotient (IQ) testing . Moreover, the Childhood Autism Rating Scale (CARS) consisting of 15 questions scored by the parent is commonly used for diagnosis of autism. The CARS can reliably differentiate among children with autism as well as those with mental retardation . Propofol (2,6-diisoproyl-phenol) is commonly used during various procedures for sedation of children with intellectual dysfunction which limits cooperation [4,5]. Currently, there exists a lack of literature describing autistic children and their anesthetic needs, further studies are needed . A previous report suggested that relatively high levels of propofol are required to manage patients with intellectual disabilities . Working in a tertiary center we too have noticed, while managing autistic children undergoing ABR testing, that sedation requirement varies appreciably among these children. Hence, our aim is to examine the presence of a possible association between the anesthetic requirements of children undergoing this test and the degree of abnormality discovered by the test. The primary objective is to compare the anesthetic requirements among the ABR test result groups, and secondarily to compare the anesthetic requirements between groups of children according to their definitive clinical diagnosis. This retrospective analysis was approved by the Institutional Review Board of our institution and included patients referred for ABR testing based on a preliminary diagnosis of autism. Children sedated with propofol from January 2011 through December 2013 were identified and their records were reviewed. Cases were excluded if they were found to be above 18 years old or if information about their anesthetics or their ABR test were missing. The following data were extracted from the anesthesia sheets and electronic files: patient’s age, gender, weight, height, American Society of Anesthesia (ASA) grading; Intelligence Quotient (IQ) test result; CARS score; past medical history, comorbid diagnoses and medications taken preoperatively. Additional extracted data included types and doses of medications administered intra-operatively with reference to the number and magnitude of propofol doses, (total propofol doses for every kg body weight were calculated), doses of midazolam and perioperative complications. The following were extracted from the anesthesia record to calculate operative time parameters: “time out”, start of the procedure, end of the procedure and fulfilment of the full recovery criteria . Procedural sedation at our hospital was performed in accordance with standard guidelines . All patients were nil by mouth for at least 2-8 hours, and had a functional intravenous catheter. Patients were continuously monitored by a combination of one certified anesthetist and anaesthesia technician throughout the procedure. Heart rate, respiratory rate, and oxyhemoglobin saturation were continuously monitored. Noninvasive blood pressure was measured every 5 minutes during the procedure and every 5-15 minutes during recovery. End-tidal CO2 was monitored via nasal cannula. Premedication with intravenous midazolam (0.05-0.08 mg/kg) was given to each study patient. Propofol was available in a final concentration of 10 mg/ml and administered intravenously at increments of 10 mg, flushed with 10 ml of normal saline 0.9%. The increments were continued until the patient was deemed adequately sedated. Incremental dosing followed with flushing was used to avoid overdosing with a continuous infusion. After the procedure, patients were monitored until they returned to their baseline neurological status. ABR testing was performed under sedation for all children. Analysis time was 10 seconds. One electrode was placed on each ear lobe and a third on the forehead for grounding. Electrode impedance was less than 5 kOhms and inter-electrode impedance was within 2 kOhms. Click stimuli were presented at 70 dBnHL. The click was averaged across 1000 sweeps and was replicated. Waves I, III, and V were identified and their latencies were measured. Wave I and wave V amplitudes were determined for 70 dBnH click -evoked waveforms. ABR was detected by placing electrodes on the scalp and separating the response from background electroencephalography measures using averaging and amplification techniques . Although the absolute latencies can be influenced by peripheral hearing loss, the interpeak latencies are generally accepted as measures of central neural conduction time and are influenced by myelination of nerve fibers . Patients were assigned according to the presence of abnormal morphological waveforms into the following groups: Group I, (Normal) who have normal bilateral wave morphology of ABR waves; group II (Unilateral) who had unilateral abnormal ABR wave morphology either in right or left ears; group III (Bilateral) had bilateral abnormal ABR wave morphology in both ears. For objectivity of patient classification, ABR results, the IQ, and the CARS test results were added to the database only after capturing all data from anesthesia records. Patients attended Phoniatrics outpatient clinics with parents who observed language delay in their child. Each patient was subjected to a standard protocol of language evaluation. Psychometric evaluation including Stanford-Binet Intelligence Scale for assessment of IQ and CARS test for autism. All patients were referred to audiology unit for hearing evaluation. This test consists of 15 questions. A score of 30 to 35 indicates mild autism while a score of 36 and higher indicates moderate to severe autism. Scores are based on direct observation and items are scored from 1-4. A score of 1 indicates age appropriate behavior and a score of 4 indicates severely abnormal behavior. All items contribute equally to the total score that varies from 15 to 60 . Statistical analysis was performed on SPSS version 11.0. Numeric data were presented as mean ± SD, median and interquartile range. Comparison between groups of ABR abnormality (normal, unilateral, and bilateral) was done by the ANOVA or Kruskal Walis test. Alpha values were all set at 0.05 but for multiple comparisons Bonferroni correction was used. Categorical data were presented as percentages and were compared by chi square test. Propofol dosing data were examined for normality of distribution and were converted to the log scale in case of right skewness. Univariate linear regression models were constructed to test the effect of different variables on log transformed propofol dose. Factors with significant coefficients at a level of 0.05 were incorporated in multiple regression models. The likelihood ratio test was used to explore the relative contribution of different predictors to the multiple regression models. From January 2011 to December 2013, 227 children were identified to have the ABR test and fulfilled the inclusion criteria; among these 62 had normal ABR while 80 and 85 had unilateral and bilateral abnormalities, respectively. Table 1 shows the demographic and clinical characteristics of the patients. The age ranged from nine months to 13 years with a mean value of 4.3 ± 2.2 and did not differ significantly among the groups. BMI: Body Mass Index, kg/m2; ASA: American Society of Anesthesiology Classification; IQ: Intelligent Quotient; CARS: Child-hood Autism Rating Scale; IQR: Interquartile Range. CARS score is described for (Autistic patients; n=52). Table 1: Demographic and clinical characteristics of study patients stratified by extent of affection assessed by Auditory Brainstem Response (ABR) test. There was a male predominance in the total population as well as in the individual groups. A little less than half of the patients had positive history of consanguinity; 46.3% in the unilateral and 37.6% in bilateral group (p=0.116). In addition, less than a half had a positive family history of autism. Most of the children in the three groups were free from congenital mental illness. However, neurological history; anti-convulsant therapy; renal and hepatic diseases were comparable between groups. A few children had cardiac conditions and many more had respiratory disorders, however associated neurological conditions were most commonly seen, ranging between 11% and 14%. Use of anticonvulsants was recorded in less than 10% in all groups. The group with bilateral ABR abnormality had a significantly higher mean body weight. ASA score distribution and the CARS score of autism were similar among the study groups. However, the IQ value was significantly higher in the group with unilaterally abnormal ABR readings as compared to the other two groups. The CARS score was not recorded for those with no autism (117 cases); also the score was achievable for comparison only with autistic children (n=52) (Table 1). 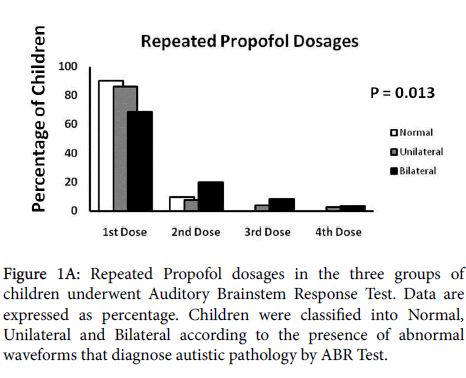 A significantly higher proportion of children with unilateral and bilateral ABR abnormality required larger doses of propofol compared to those with bilaterally normal ABR readings; most of children with abnormal bilateral ABR group required more than two doses (Figure 1A). Figure 1A: Repeated Propofol dosages in the three groups of children underwent Auditory Brainstem Response Test. Data are expressed as percentage. Children were classified into Normal, Unilateral and Bilateral according to the presence of abnormal waveforms that diagnose autistic pathology by ABR Test. None of the procedure time parameters, including the recovery time, differed significantly among groups (Table 2). There was also no significant difference in operative complications among the groups apart from increased percentage of needed additional sedation that was significantly higher in the group with bilateral abnormality (Figure 1B). Figure 1B: The Percentage of needed additional sedation in the three groups of children underwent Auditory Brainstem Response Test. Data are expressed as percentage. Children were classified into Normal, Unilateral and Bilateral according to the presence of abnormal waveforms that diagnose autistic pathology by ABR Test. The need for additional sedation i.e. additional boluses of propofol was administered, till control of any spontaneous movements or agitation during the ABR procedure. Most variables were presented as mean ± SD; or median ± IQR. Total procedure time=Actual procedure time+Recovery time, Actual procedure time=start of sedation till end of the ABR procedure recording. Table 2: Intra-operative parameters of study patients stratified by extent of affection assessed by Auditory Brainstem Response (ABR) test. Using univariate linear regression with log propofol dose as the dependent variable, only midazolam dose, weight and ABR abnormality were found to show statistically significant association (Table 3). When the three variables were simultaneously incorporated into a multivariate linear model, they all remained significantly associated with the log propofol dose indicating that after adjusting for midazolam dose and for body weight, the extent of ABR abnormality remained an independent predictor for propofol requirement (Table 4). BMI: Body Mass Index, kg/m2; IQ: Intelligent Quotient; CARS: Childhood Autism Rating Scale; (95% CI), 95% confidence interval. Children were classified into Normal, Unilateral and Bilateral according to the presence of abnormal waveforms that diagnose autistic pathology. Table 3: Results of univariate linear regression analysis for the relation of different factors to the log propofol dose. (95% CI): 95% Confidence Interval. Children were classified into Normal, Unilateral and Bilateral according to the presence of abnormal waveforms that diagnose autistic pathology. Table 4: Results of multiple linear regression analysis for the relation of different factors to the log propofol dose. Likelihood ratio test (Table 5) shows that the midazolam dose seems to be the most important predictor for propofol requirement, however, the extent of the ABR abnormality plays a very important role as well. Children were classified into Normal, Unilateral and Bilateral according to the presence of abnormal waveforms that diagnose autistic pathology. Table 5: Results of likelihood ratio test on the multivariate model for the effect of weight, lesion, and midazolam dose on the log of the propofol dose. Notably, one patient in the bilateral abnormality ABR group experienced vomiting, while cough was reported in one patient in each the normal and unilateral abnormality ABR groups. No patients experienced laryngospasm. 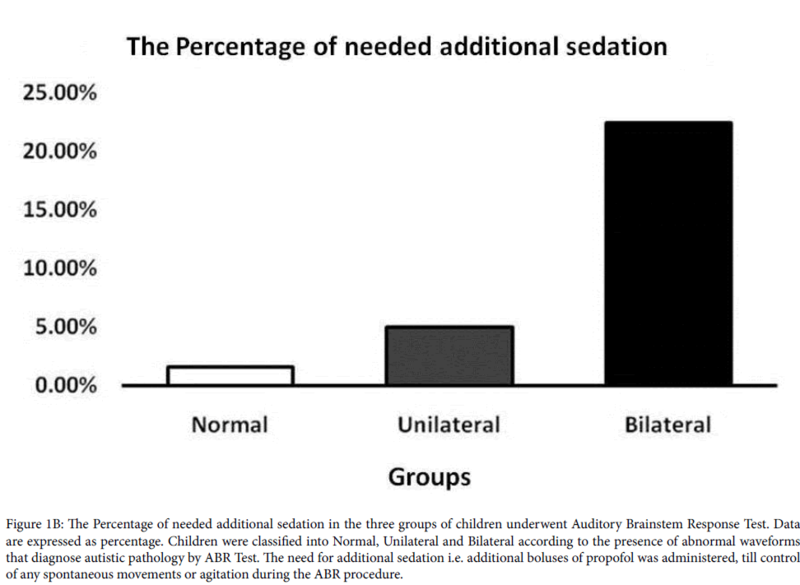 Our data revealed that sedation requirements vary for children undergoing ABR in our institution. The extent of autistic pathology in the form of abnormal morphological waves assessed by ABR test was an independent risk factor for increased propofol requirements. In addition, child’s weight and premedication with midazolam were independent risk factors that affected the amount of propofol needed during the ABR procedure. A few reports described variation in dose requirements of propofol sedation. Asahi et al., in 2009, compared the propofol requirements and its effect during dental treatment in 56 autistic patients. Their results revealed increased propofol requirements in autistic patients when compared with 56 intellectually impaired patients. But, the study population included both children and adults, and the propofol infusion rates in the intellectually impaired group showed significant decline with age . Other studies too suggested that relatively high levels of propofol are required to manage patients with intellectual disabilities [7,14]. Sedation failure rates of 20-30 % and inadequate sedation of 15-22.5% have been reported depending on the sedation regimen used . Similarly, our study showed that it was needed additional sedation in 20% of autistic children. This percentage was lower in other two groups. This confirms the findings outlined above and the fact that sedation is more difficult in this subset of patients. Interestingly, Kitt et al. 2015, did not find higher sedative requirements in children with attention-deficit hyperactivity disorder However, it is well established attention-deficit hyperactivity disorder and autism arise from distinct neuronal pathologies . There exist several potential explanations for increased propofol requirements in autistic patients. Autistic children are known to have decreased amplitude of ABR evoked potential. This can be explained on the basis of an increased transmission time due to decrease in the myelination or the synaptic efficiency in the brain stem nuclei [17,18]. A previous study  described a maturational defect in myelination within the brain stem in autism. Mastschke et al. demonstrated that myelination takes place in the first year of life and this is necessary for functional maturation . A functional MRI study has revealed that the degree of synchronization was lower for the autistic than for others. This functional under connectivity could be due to microgliosis and astrogliosis  and can result in delayed nerve conduction . It may explain the relatively increased doses of sedatives to achieve the desired level in autistic patients. Several factors could explain, in particular, the variability in propofol requirements in these children. Propofol is known to act via gamma amino butyric acid (GABA)A receptors [23-26]. The neuro-developmental disorder that accompanies autism involves some structural changes such as delayed cortical development with larger white matter and lack of the mirror neuron system . These abnormalities may involve the GABA inhibitory system. Ma et al. , for example, reported that autistic patients have abnormal (GABA) A receptors. Also Yu  has stated that there is a change of (GABA) A receptor subunit distribution during brain maturation for autistic children. The different response of autistic patients to propofol may also correlate with their hypersensitivity to acoustic stimuli and increased serum levels of glutamate . The serum levels of glutamate, an excitatory neurotransmitter, are increased in adult autistic patients . Propofol potentiates the inhibition of glutamate release as described before in experimental studies [32,33] . Thus, an increase in glutamate may be expected to make autistic children in need for bigger propofol doses to achieve the desired pharmacological effect. In the current study, midazolam was an independent risk factor for propofol dosing. Midazolam is generally used to reduce anxiety in children undergoing ambulatory procedures such as the MRI (Machata et al.). Rainey et al. has used it in autistic children to reduce their delirium. Midazolam is known to possess a synergistic effect with propofol [34-36]. Indeed, Midazolam dose did not show a statistically significant difference between groups of children but there was a significant negative correlation between it and the log propofol dose which is expected since children receiving a bigger dose of any sedative would need a relatively smaller dose of the other. Given the relatively small sample size, we thought it would be safer to include midazolam in the multivariate regression model to adjust for its correlation with propofol. The positive association between the midazolam dose and the extent of the lesion observed in this study can be explained based on the general increase in sedative requirements and because of the relative resistance to the action of propofol that dictated the increase on midazolam to achieve the desired target. In the present study, the required propofol dose was found to be significantly associated with the extent of ABR abnormality but not with the autism diagnostic tools including IQ and CARS tests. The increased propofol requirements may be related to structural brain abnormalities which manifests ABR abnormalities. The link to a clinical syndrome may less direct. Follow up studies using larger numbers of patients may reveal other subtle associations. The association of propofol doses with the extent of ABR abnormality was not accompanied by a significant change in the procedure time parameters. Although children with ABR abnormality received higher propofol doses, they required a similar amount of time to recovery as their peers. This indicates that affected children are in real need of increased propofol dosing. The current study has its own limitation due to its retrospective nature and limited number of patients. During the period of this study, we have not got target-controlled infusion (TCI) machines at our institution. Future prospective studies should be completed to address the underlying mechanism of increased demand for sedatives in patients with ABR abnormalities. Comparison of different types of sedatives can be also investigated to get suitable combinations that may provide better sedation control in such patients. The results of our observational study may have an impact on the management of children who are diagnosed with autism. They may frequently undergo anesthesia or sedation for other surgical purposes. ABR testing may provide key clinical information about the anesthetic requirements in autistic patients. Autistic children may require increased propofol doses. This group of children need careful documentation of their increased requirements for future use in other types of surgeries as this can affect their outcome and safety. The authors did not receive any grant or financial support for this study. First and Second authors have equally contributed to this work. HE performed the data collection, participated in the study design, statistical analysis and wrote the manuscript. DA participated in the data collection, study design, statistical analysis, and interpretation of data. S. Elmorsy participated in the study design, statistical analysis, and interpretation of data and writing of manuscript. AB participated in the data collection; TY participated in the data collection; Aboloyoun participated in the study design, preparation and critical revision of the manuscript. Al Attar participated in the study design, and in the preparation and critical revision of the manuscript. A portion of these results was presented at the Australian & New Zealand Society of Anesthesiologists, ASM-ANZCA held in Adelaide, May 2015. Dr Wessam Ahmed, who was the first got observation; Dr Manal Mashaat; Head of Anesthesia department; Dr Bayan Alzahrani; Dr Emran Alsawaf; Dr Tariq Alsubhi; in Umm Al Qura university, for data collection. Dr M. Kareemulla Shariff, MRCP, MD, Dr Abdulhamid Alsaigh for their critical revision of the manuscript. The authors thank Dr. Michael Schnetz, Department of Anesthesiology, University of Pittsburgh Medical Center, for his editorial assistance with the article. [No authors listed] (1992) American Academy of Pediatrics Committee on Drugs: Guidelines for monitoring and management of pediatric patients during and after sedation for diagnostic and therapeutic procedures. Pediatrics 89: 1110-1115. Asahi Y, Kubota K, Omichi S (2009) Dose requirements for propofol anaesthesia for dental treatment for autistic patients compared with intellectually impaired patients. Anaesth Intensive Care 37: 70-73. Buggy DJ, Nicol B, Rowbotham DJ, Lambert DG (2000) Effects of intravenous anesthetic agents on glutamate release: a role for GABAA receptor-mediated inhibition. Anesthesiology 92: 1067-1073. Cressey DM, Claydon P, Bhaskaran NC, Reilly CS (2001) Effect of midazolam pretreatment on induction dose requirements of propofol in combination with fentanyl in younger and older adults. Anaesthesia 56: 108-113. Dalal PG, Murray D, Cox T, McAllister J, Snider R (2006) Sedation and anesthesia protocols used for magnetic resonance imaging studies in infants: provider and pharmacologic considerations. Anesth Analg 103: 863-868. Daskalopoulos R, Korcok J, Farhangkhgoee P, Karmazyn M, Gelb AW, et al. (2001) Propofol protection of sodium-hydrogen exchange activity sustains glutamate uptake during oxidative stress. Anesth Analg 93: 1199-1204. Eaves RC, Milner B (1993) The criterion-related validity of the Childhood Autism Rating Scale and the Autism Behavior Checklist. J Abnorm Child Psychol 21: 481-491. Eggermont JJ, Don M (1986) Mechanisms of central conduction time prolongation in brain-stem auditory evoked potentials. Arch Neurol 43: 116-120. Fein D, Skoff B, Mirsky AF (1981) Clinical correlates of brainstem dysfunction in autistic children. J Autism Dev Disord 11: 303-315. Fodale V, Pratico C, Santamaria LB (2004) Coadministration of propofol and midazolam decreases bispectral index value as a result of synergic muscle relaxant action on the motor system, Anesthesiology 101: 799. Gillberg C, Rosenhall U, Johansson E (1983) Auditory brainstem responses in childhood psychosis. J Autism Dev Disord 13: 181-195. Gomot M, Giard MH, Adrien JL, Barthelemy C, Bruneau N (2002) Hypersensitivity to acoustic change in children with autism: electrophysiological evidence of left frontal cortex dysfunctioning. Psychophysiology 39: 577-584. Hadjikhani N, Joseph RM, Snyder J, Tager-Flusberg H (2006) Anatomical differences in the mirror neuron system and social cognition network in autism. Cereb Cortex 16: 1276-1282. Herbert MR (2005) Large brains in autism: the challenge of pervasive abnormality. Neuroscientist 11: 417-440. Hosey MT, Makin A, Jones RM, Gilchrist F, Carruthers M (2004) Propofol intravenous conscious sedation for anxious children in a specialist paediatric dentistry unit. Int J Paediatr Dent 14: 2-8. Just MA, Cherkassky VL, Keller TA, Kana RK, Minshew NJ (2007) Functional and anatomical cortical underconnectivity in autism: evidence from an FMRI study of an executive function task and corpus callosum morphometry. Cereb Cortex 17: 951-961. Kitt E, Friderici J, Kleppel R, et al. (2015) Procedural sedation for MRI in children with ADHD. Paediatr Anaesth 25: 1026-1032. Klin A, Pauls D, Schultz R, Volkmar F (2005) Three diagnostic approaches to Asperger syndrome: implications for research. J Autism Dev Disord 35: 221-234. Leitch JA, Anderson K, Gambhir S, Millar K, Robb ND, et al. (2004) A partially blinded randomised controlled trial of patient-maintained propofol sedation and operator controlled midazolam sedation in third molar extractions. Anaesthesia 59: 853-860. Leung A, Kao CP (1999) Evaluation and management of the child with speech delay. Am Fam Physician 59: 3121-3128. Ma DQ, Whitehead PL, Menold MM, Martin ER, Ashley-Koch AE, et al. (2005) Identification of significant association and gene-gene interaction of GABA receptor subunit genes in autism. Am J Hum Genet 77: 377-388. Matschke RG, Stenzel C, Plath P, Zilles K (1994) Maturational aspects of the human auditory pathway: anatomical and electrophysiological findings. ORL J Otorhinolaryngol Relat Spec 56: 68-72. McClelland RJ, Eyre DG, Watson D, Calvert GJ, Sherrard E (1992) Central conduction time in childhood autism. Br J Psychiatry 160: 659-663. Miyawaki T, Kohjitani A, Maeda S, Egusa M, Mori T, et al. (2004) Intravenous sedation for dental patients with intellectual disability. J Intellect Disabil Res 48: 764-768. Norrix LW, Trepanier S, Atlas M, Kim D (2012) The auditory brainstem response: latencies obtained in children while under general anesthesia. J Am Acad Audiol 23: 57-63. Paspatis GA, Charoniti I, Manolaraki M, Vardas E, Papanikolaou N, et al. (2006) Synergistic sedation with oral midazolam as a premedication and intravenous propofol versus intravenous propofol alone in upper gastrointestinal endoscopies in children: a prospective, randomized study. J Pediatr Gastroenterol Nutr 43: 195-199. Rainey L, van der Walt JH (1998) The anaesthetic management of autistic children. Anaesth Intensive Care 26: 682-686. Ramsay MA, Savege TM, Simpson BR, Goodwin R (1974) Controlled sedation with alphaxalone-alphadolone. Br Med J 2: 656-659. Schopler E, Reichler RJ, DeVellis RF, Daly K (1980) Toward objective classification of childhood autism: Childhood Autism Rating Scale (CARS). J Autism Dev Disord 10: 91-103. Sebel LE, Richardson JE, Singh SP, Bell SV, Jenkins A (2006) Additive effects of sevoflurane and propofol on gamma-aminobutyric acid receptor function. Anesthesiology 104: 1176-1183. Shinohe A, Hashimoto K, Nakamura K, Tsujii M, Iwata Y, et al. (2006) Increased serum levels of glutamate in adult patients with autism. Prog Neuropsychopharmacol Biol Psychiatry 30: 1472-1477. Sitar SM, Hanifi-Moghaddam P, Gelb A, Cechetto DF, Siushansian R, et al. (1999) Propofol prevents peroxide-induced inhibition of glutamate transport in cultured astrocytes. Anesthesiology 90: 1446-1453. Stephens AJ, Sapsford DJ, Curzon ME (1993) Intravenous sedation for handicapped dental patients: a clinical trial of midazolam and propofol. Br Dent J 175: 20-25. Wakasugi M, Hirota K, Roth SH, Ito Y (1999) The effects of general anesthetics on excitatory and inhibitory synaptic transmission in area CA1 of the rat hippocampus in vitro. Anesth Analg 88: 676-680. Westphalen RI, Hemmings HC (2003) Selective depression by general anesthetics of glutamate versus GABA release from isolated cortical nerve terminals. J Pharmacol Exp Ther 304: 1188-1196. Yu ZY, Wang W, Fritschy JM, Witte OW, Redecker C (2006) Changes in neocortical and hippocampal GABAA receptor subunit distribution during brain maturation and aging, Brain Res 1099: 73-81.